Whether it's Spring or Fall, fantasy and illusion inspire designers and makeup artist with the unexpected mix of dark's, bright and neutrals in fashion and cosmetics. Typically fall and winter would be limited to dark color palettes while spring and summer would be geared more towards lighter and neutral shades. But who says you can't wear whatever you'd like when it comes to makeup and color palettes? The key is in finding your individuality in color choices. Whether it's cheeks, lips or eyes, your makeup can be used for multipurpose. And guess what? You don't have to have a wide range of colors. One color is all you need! Most of you know what it means to choose a good neutral color, so try your hand at adding a new bold one to your makeup bag. So often you think that a full make over is necessary, that's not necessarily so. Simple choices from a new color palette and you'll come across as though you've had a make over. Go through your make up bag and pull everything out. Determine what is working for you and what isn't. Either trash it or give it to a friend but only if it hasn't been used. But before you do either, try blending what you already have and see if you can create a new combination of colors that will work for you. Beautiful Black Skin is Always In! 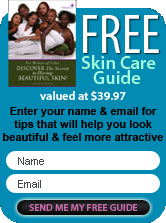 If you've maintained your black skin care regimen, your skin should be showing off its healthy glow. Always strive for a flawless complexion that's alive and the perfect canvas for whatever color you choose to wear. Blending is the key. Understanding your complexion, its undertones and colors that work for you will take you a long way. Blending those colors into your complexion once you find them will have you looking like a star. Whether you choose vivid and vibrant or mellow and muted, your eyes and lips will definitely draw attention to your beauty. Bold, smoky eyes that feature jewel-toned shadow, that's definitely a winner. Bold lips make great options. A new lipstick color can be your best buy for an up coming seasonal change. So ... if you want more fantasy than typical traditional in your color choices for make up, play it up with a bold new color in your makeup bag. Variety and newness is how you move into any upcoming season with your make up choices.